Milk Alternatives Versus Cow's Milk: What's The Best Bet For Your Child's Nutrition? Milk has long been touted as a complete health drink much before the advent of the nutrition-packed beverages. Experts suggest milk as a complete meal in itself. It comes fortified with a range of nutrients vital for the regulation, maintenance and development of various processes in the body. For those who are lactose intolerant, there are nut milks, which come as a sigh of relief. With its advent, more and more people today are making a switch to such milk alternatives, including kids who are not necessarily lactose intolerant. But is this swap a smart move for your kid's health? Canadian experts have found that kids who depended on milk alternatives - nut milks, soy milk - were shorter by 1.5 centimeters at the age of three when compared to their peers who were fed whole cow's milk. Protein and insulin-like growth factors present in cow's milk are said to significantly boost a child's development and growth. Milk has long been touted as a complete health drink much before the advent of the nutrition-packed beverages. Here are few points enumerating the health benefits of milk and why it must be an indispensable part of your and your kids' diet. It also comes packed with essential nutrients like Vitamin A, B1, B2, B12, D, choline, magnesium, and potassium among others. Milk fortified with vitamin D is excellent for bone growth, development and strength. It also boosts immunity. Every one cup (250 ml) of milk supplies close to 285mg calcium - over 20% of your daily requirement. "It would be wrong to say that switching to nut milks or alternative milks may cause stunting in kids. Many children are chronically allergic to milk and their only option is milk alternatives. Ideally, one should get in touch with a certified nutritionist to figure out how best all the essential nutrients can be supplied in your child's diet. If you're child's diet is meeting his/her daily nutritional requirement, I don't see any cause of development issues. Milk alternatives are usually not a viable option here as they aren't easily available for the masses, and are expensive. 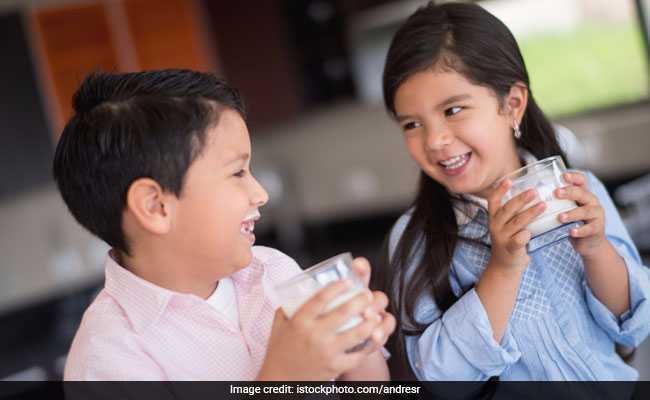 You know that you need to give two glasses of milk to your child, one might not know how much of nut milk is enough," added Dr. Ritika Sammadar, Max Healthcare, New Delhi. Another study conducted by a team of experts at the Washington University stated that adding an egg a day in children's diet may reduce the risk of stunting significantly.